I enjoy making clothes from vintage patterns. Some I buy in charity shops, but most I get on eBay. On the whole I buy the cheaper ones, searching by “lowest price” rather than anything else. If you buy patterns here you may have noticed patterns offered from a company called The Vintage Pattern Shop. They sell not original vintage patterns but copies. Although the company have dozens of great out of print and out of copyright patterns in their range, I thought they were relatively expensive (around £15-£20, plus £3 for postage) and I prefer to buy an original. But sometimes there is a pattern that you want that is simply not available. You can stalk international sellers for years and still never find it. Or sometimes and original maybe available but the price is quite extraordinary – an original Schiaparelli went on eBay UK recently for nearly £200. While I like the old envelopes, the sense of excitement associated with opening and using something that may never have been used before, or may have last been sewn up 50 or 60 years ago, I am not precious about originals. Most of the ones I own I alter as if they were new. I don’t treat them like precious relics, tracing them off or strengthening them with iron on products. In theory I have absolutely no problem with a copy shop version. I know there are PDFs of knitting patterns too. But they are more like a recipe, aren’t they? I am guessing a photocopy is fine. My issue, apart from price, was I didn’t know what I was getting. I felt the same before my first time with a PDF downloadable pattern. Thankfully a number of companies provide a reassuring, free practice pattern. This way you can download a pattern, ensuring it prints on one side of paper, doesn’t scale to fit, etc, and then you discover how easy it is to assemble the jigsaw at home. So if you have ever considered buying a reproduction pattern, here is my review. I was looking for a puff sleeved blouse, with embroidery – not an everyday thing. I am fond of 1940s blouses so looked for vintage first. 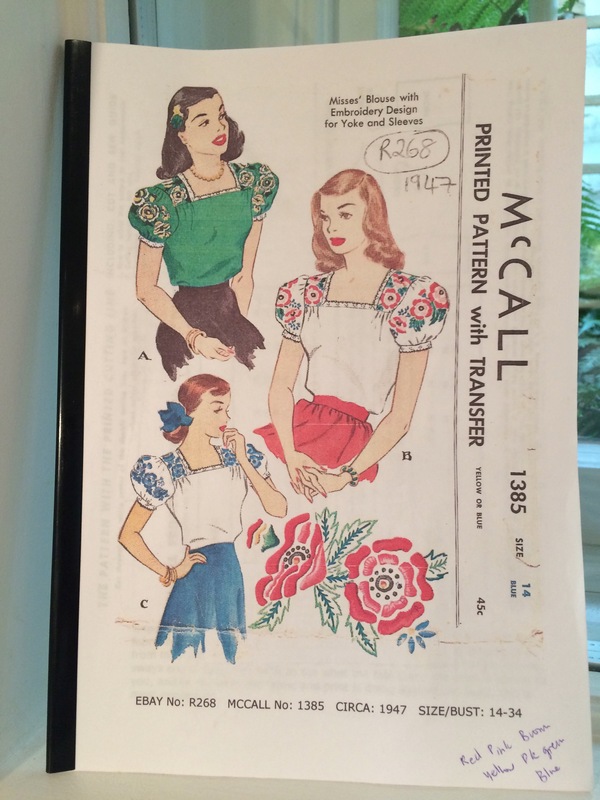 I did search for a while, but the blouse I liked the best, McCall 1385, was only available as a reproduction. So, in the interests of science, I ordered one. Because the embroidery was the thing here (I could have drafted this blouse myself), I checked with the seller that the embroidery pattern was included. She assured me that it was by eBay email. I ordered the pattern and, via eBay, gots lots of follow up mail. The pattern arrived about a week after I had paid for it. Everything was in a neat folder. Inside was a colour photocopy of the pattern envelop, with a date and reference number. The picture was very important in this case as it includes vital information on the embroidery pattern – the biro is me thinking through the colour scheme I might adopt. All of them are so beautiful, aren’t they? The pattern pieces and all the original instructions were copied onto one large brown paper sheet – much more robust than the normal pattern tissue, but not so stiff that pins would struggle. It is about the same weight as pattern cutting paper. I cut round the pieces with paper scissors first rather than ruin my shears. The brown paper contributed to the vintage feel. The instructions were not perfectly printed, but that maybe because the pattern was pretty old (c1947). But it is a simple enough blouse in terms of construction. Although it has a gusset (arrgh…!). Included in the booklet were some “bonus items” – for example a chart to convert inches into centimetres, a page explaining how to measure yourself, and how to alter the pattern to fit. I guess this might be important to some people I found it a bit extraneous. What was slightly bizarre was that there were two blank pages for “notes” and a strange sheet of paper included about what was happening in the news in 1947 downloaded from somewhere. Whatever, as they say. I have nothing against this product, except the price. If there is a pattern I really wanted I would be prepared to spend around £23 to get it, even though it is a reproduction. For me I didn’t find the pattern better than an old one, except perhaps it was a little bit less fragile. This will look super on you, though I imagine with the satin stitch embroidery it will take some considerable time to complete. Patterns from that era often used gussets because the armhole tended to be cut high. I’m not surprised when small scale pattern outlets have high prices, having looked into the cost of printing short runs. Like Esme I love this shirt, too. You’re really making me want to take on a project like this. I haven’t done embroidery for years but it might be worth it for this kind of thing. I am going to go scouting.. Very Interesting Review – thank you. I guess the copyrights on those old patterns must have expired, since they’re being sold like this. Interesting. I’m looking forward to hearing more about the gusset and the embroidery of course. I’ve never used a vintage pattern or even a reproduction one – though I have a few. I’m assuming 70s, 80s don’t count as vintage. I can’t wait to see the finished shirt. And I agree with you that including the frivolous sheets of paper is silly. Perhaps that is how they justify the price. And I do wonder about copyright issues but I guess on old patterns it doesn’t matter? I just looked at the ‘Wanted’ page on your website and will be on the look out for those patterns. I know I have not passed them up at the thrift store already since they all appeal to me as well. I love vintage patterns and read them like they are a magazine. I’ve never paid more than a dollar for one so they are cheaper than magazines too! There are lots of gussets in the blouses and dresses of this time, good luck fitting yours. Thanks for the review of the reproduction pattern. Quite expensive, but worth it for a specific special pattern. Thank you for this article. I had a very bad experience with The Vintage Pattern Shop or TVPStore on Etsy. The seller “Lady Queenie Quinn” cursed me out for asking a simple question. Her patterns are printed on quality paper, but her customer relations was very poor and unprofessional, especially considering I paid $40+ for the pattern.